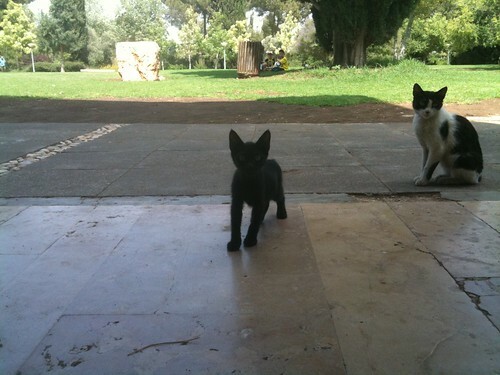 Jerusalem is overrun with feral cats. 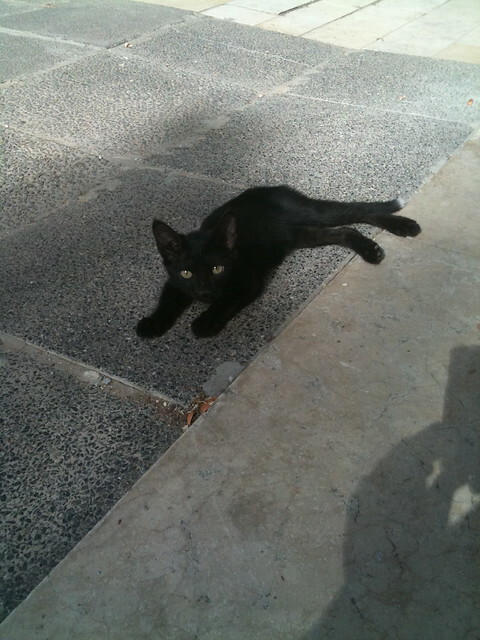 In December, one came up to me in the Old City and just began nuzzling my legs. They’re everywhere on the Hebrew University campus, fishing falafel wrappers out of trashcans and eating leftover chips. This morning on a walk, I encountered a man who feeds the same four every day, including a rather pregnant female. One outside of our apartments is at the trashbins every morning at 9 am, going through the dumpsters in search of first breakfast. This morning during a teaching workshop, I began hearing a soft “mew” in the classroom. Was it Mor’s chair being squeaky? The mewing stopped, then started again. Was it my chair? No, I wasn’t moving. Were Mustafa’s shoes making that noise? That really sounded like a cat. Ben got up to inspect the corner of the classroom. Was it a cat? Nothing behind the lectern. Mustafa got up to check behind the curtain, revealing an incredibly tiny, scraggly black kitten with the most adorable white-tipped tail cowering on the windowsill behind the curtain. I tried offering it a bit of my turkey sandwich, but Tiny Cat huddled further into the windowsill, anxiously eyeing us humans. After a long pause, Tiny Cat hopped up and tried to running out of the classroom. A combination of high kitten velocity (vk) and a low coefficient of kinetic friction (µk) foiled Tiny Cat’s attempt to flee via the door, resulting in a mass of ruffled black fur, various limbs, and the white-tipped tail splaying out in all directions from Tiny Cat’s body as the feline slid along the slick tile. Reversing course, Tiny Cat decided to re-enter the classroom, realized there were 20 absolutely terrifying humans in the room, made an about-face, and scuttled its way out the door and down the hallway past some confused-looking students. Thus, today’s lesson from the discussion on education versus instruction: always check your classroom for cats before teaching in Jerusalem. I tried to get one last night but didn’t have my CF card.